What’s your favorite kind of food? Me, I’ve got lots; Chinese food, Italian, BBQ. At the top of the list though is Mexican food. Tacos, burritos, horchata you name it! But there is one thing I’m not a huge fan of…enchiladas. Maybe it’s because I always end up making them too saucy or too spicy; there is just something about them I haven’t fallen in love with. When my good friend Meaghan, from Cook. Craft. Love invited me to join her and 10 other talented ladies in this month’s ingredient challenge of cilantro I knew exactly what I wanted to make; an enchilada I would actually like to eat. Challenge accepted. I thought about what ingredients I liked in some of my other Mexican favorites and honey lime immediately came to mind. Unfortunately I only had one lime and I had already gone grocery shopping for the next 2 weeks so I wasn’t about to step foot in a store again and tempt myself to buy more than just a lime. What I did have was lemon juice. And who doesn’t love lemon and lime; am I right?! And you know what… I have a new favorite Mexican dish. 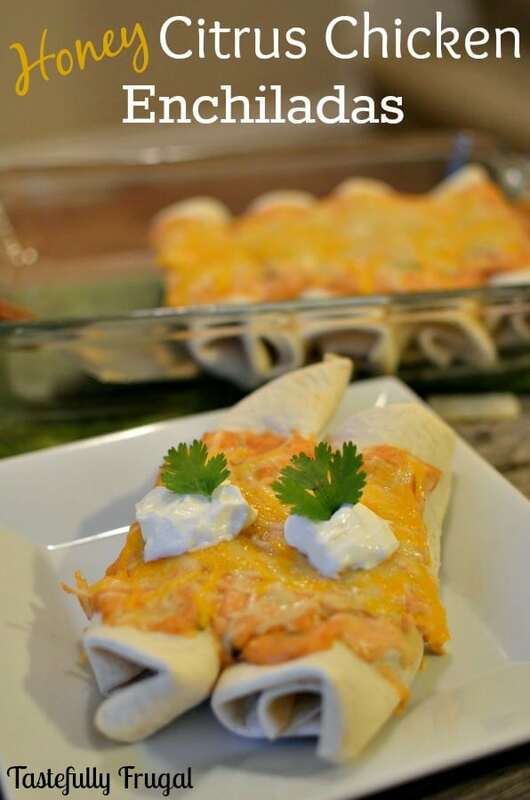 These enchiladas had the perfect mix of sweet and citrus. The chicken was moist and juicy and the sauce on top was creamy and tangy. Plus you can throw these together in about 20 minutes; and I’m all for a quick and easy dinner. 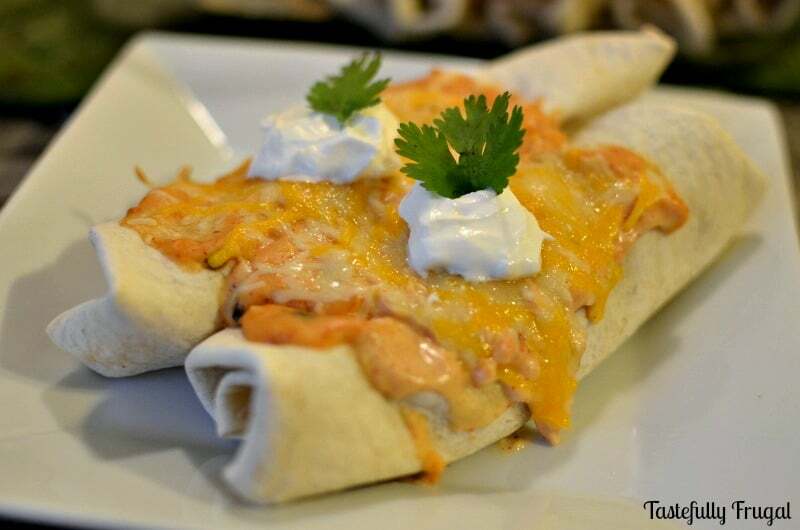 Juicy chicken drenched in a sweet, citrus sauce wrapped in a tortilla covered with a tangy, creamy sauce & topped with cheese. Cook chicken in a skillet or on grill and shred. While chicken is cooking combine cornstarch and water in a bowl. Add honey, lime juice, lemon juice, vinegar, zest, cilantro, chili powder and garlic powder to cornstarch mix and stir to combine. Pour remaining sauce and chicken into an airtight container and shake to combine. Sprinkle 1 Tbsp cheese along center of tortilla. Add 2-3 Tbsp chicken on top. 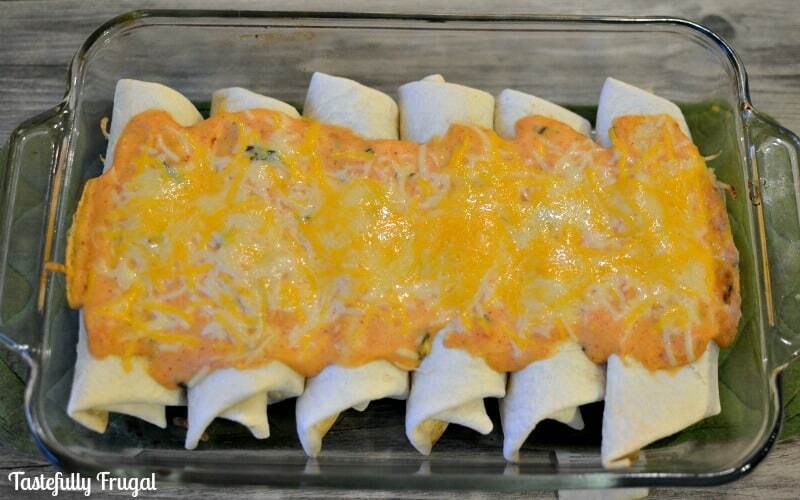 Roll up tortilla and place in a greased 9x13 dish. Combine reserved sauce with sour cream and stir to combine. Spread sauce on top of enchiladas and sprinkle with remaining cheese. You can also freeze these before cooking and save in the freezer for an even quicker weeknight dinner. Just remove from freezer and allow to thaw while oven is preheating. Now that you’ve seen what I’ve created with cilantro, head on over and check out these 11 other great recipes! I’m always looking for quick weeknight dinners! Thanks for sharing this one! Thanks for visiting Roxanne and this is a so quick and easy to make. I love your pico/salsa recipe. It looks amazing! These look delicious! And bonus – I have ALL of these ingredients in my home right now! Gonna try these this week 🙂 Happy to join you on this blog hop! Thanks Lindi! And yes I love these blog hops where I have all the ingredients on hand…makes it so much easier when I am reading all these great recipes. It’s been a cilantro week for us. 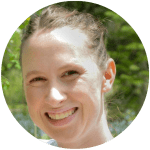 Thank you Kat and they are super easy to make…which I am a huge fan of! Thanks so much Leia and thank you for organizing everything! I tried your fries for dinner last night and they were SOOO good! Ah thank you Emily! Your soup looks and sounds beyond amazing too!! I’m putting this on my dinner list for next week! I love the combo of honey and cilantro together in one meal. Pinned and can’t wait to try! That is a very interesting combination, I will have to try. Thanks for sharing with Tasty Tuesdays. Thank you Jen! Let me know if you try them and what you think.